Find out what virtual reality topics were trending at the NAB Show 2017. VR was very popular at the NAB Show 2017 with content creators and consumers streaming into various VR-related booths every day of the show. At the VR/AR pavilion both new and seasoned companies showed their wares to large numbers of visitors including solutions for VR cameras, spatial audio, and virtual reality headsets. There were a number of panels on virtual reality, augmented reality, and 360 video and audio. Additionally, many leading companies in the VR/AR space, including Google, ARKAMYS, and GoPro, sent representatives to NAB this year. It is an exciting time for VR with increased consumer interest and technology. The NAB show demonstrated that the industry has made progress in closing some of the gaps that have been mentioned in various VR reports, although other gaps, such as iOS developments were still notably missing. In recent weeks, there has been a lot of new activity focused on VR streaming products and platforms, most significantly perhaps the announcement by Facebook of Live 360, for live streaming of 360 audio and 360 video on the Facebook platform. This announcement has been talked about in a number of articles and has likely led to some of the increased attention to 360 streaming at NAB 2017. The NAB show featured a number of ways to live stream VR audio and video, including some live streaming of the NAB show itself. 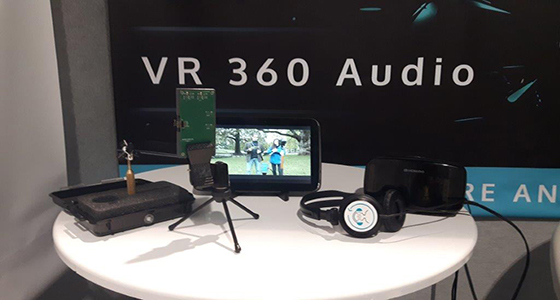 Many solutions like the 360 VR Audio Suite by ARKAMYS are ideal for creating fully immersive experiences for live streaming with 360 sound and video. The applications for live streaming with 360 audio and video include sporting events, presentations, musical performances and more. For most of these types of content, VR sound will be a crucial element not only for creating an immersive experience but also for delivering quality content since much of the content, such as lectures and concerts, place sound at the center of the experience.